Eczema is a very common disease. I will detect some form of this disorder in about 10% of all the children and adolescents I examine. Although the cause is not know, there is a definite family trait producing this red, itchy rash. About ½ of all children diagnosed to have eczema will also have hay fever or asthma. The first signs of eczema appear after the baby is a couple of months old. Most children will develop the rash by 6 years of age, if they have any tendency to produce it. Characteristically, the rash comes and goes over weeks to months. Most of the damage provoked by this itchy rash is caused from scratching and rubbing it. In babies the rash first appears on the face elbows and knees and diaper area. Later the rash will persist or reappear in the folds of the knees or elbows. Three-quarters of all persons with atopic dermatitis will have the rashes on their hands. 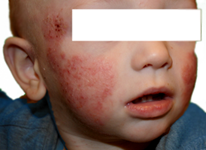 The appearance of the rash is not a helpful indicator if your child has atopic dermatitis because its characteristics vary so much individual to individual. Scratch marks often appear along with scaly, dry skin. Infection is a common complication. The skin can become quite thickened over time because of the frequent rubbing and scratching. There is a strong family history of asthma, hayfever and atopic dermatitis. The cause of atopic dermatitis in unknown. The skin becomes inflamed causing redness, itching and swelling. Some trigger or defect in certain skin cells causes them to react and produce the inflammation. Until doctors understand what factors produce the inflammation, the treatment deals with the special trigger to the dermatitis or agents to calm down the inflammation. Common triggers to produce the persistent inflammation are dry skin, irritants, emotional stress allergens, heat and sweating and infections. Skin primary purpose is to provide a barrier against dirt, infections and chemicals. In order for skin to provide optimal protection it should be soft and resilient. Atopic dermatitis patients have dry and brittle skin. This appears to be a defect in the normal characteristics of atopic skin. Heat and dryness in the air are hard on normal skin but worse for atopic skin. Too much bathing, soaping and washing with hot water can aggravate atopic dermatitis. They remove the natural moisturizers from the skin. Stress is a definite factor in developing your child’s eczema. Anything that produces stress in your child can trigger an episode, but the problem is determining what things or how much stress is needed to produce the rash. When stress factors are recognized the task is to reduce the stress whenever possible. I didn’t say it would be easy.